Oil markets are seeking higher ground, propelled by rising gasoline prices. Crude oil ended yesterday slightly in the negative, but bullishness is in the air. Markets expect a net draw from this afternoon’s API inventory data, which would support prices. 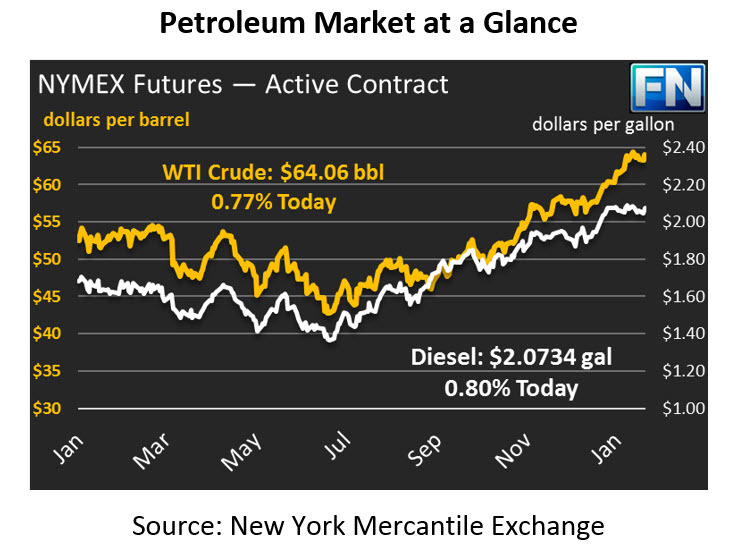 Crude oil is currently trading at $64.06, gaining 49 cents (0.8%) to surpass the $64/bbl threshold once again. Refined fuels are both in the green this morning, with gasoline leading the way higher. Diesel prices fell by a bit over half a cent yesterday, but have gained that back and more this morning. Diesel prices are up 1.7 cents (0.8%), trading at $2.0734. Prices may be getting some support from another cold snap in the Midwest, though so far temperatures have not been as extreme as a few weeks ago. Gasoline is helping raise the whole oil complex higher. Yesterday, gasoline bucked the trend and rose 1.4 cents, and gains are continuing this morning. Today, gasoline prices have risen 1.1 cents (0.6%), trading at $1.8906. Prices even peaked above $1.90 this morning for the first time since Hurricane Harvey. Gasoline’s gains have been buoyed by news that Philadelphia Energy Solutions, the largest refinery on the East Coast, is filing for bankruptcy. The company wants to restructure its finances, pinning its financial difficulties on the renewable energy requirements set up by the Renewable Fuel Standard. The bankruptcy centers around a controversy regarding the RFS, specifically, the “point of obligation” on who is responsible to retire RINs. If courts allow the company to declare bankruptcy without paying required fees associated with the RFS, other refineries may follow PES’s example and try to avoid paying biofuel costs. Click Here to learn more about the RFS and point of obligation requirements. Markets are also getting a boost from OPEC, who has been hinting that some form of production cuts could extend into 2019. Markets have been nervous about what happens after the deal expires. It looks like OPEC has an exit strategy in mind, and while the details remain murky, just knowing it’s on OPEC’s radar has helped give markets more confidence about future crude prices. Previous ArticlePain at the Pump?